Despite there being a new NBA game every year, fans of basketball still flock to the nineties game 'NBA Jam'. In fact 2017 saw the release of a fan patch to change the teams to the current roster. But what is it about this specific game that continues to draw in players who don't even like basketball? As regular readers will have noticed, when playing a retro title I like to look at the reaction the game got from reviewers at the time. They naturally lack the hindsight that modern critics have, so often the first title in a franchise is greeted with excitement. Twenty years ago reviewers obviously didn't know what was to come, so very rarely will you see someone suggesting a sequel. They’re instead lost in the excitement of a new franchise, enjoying the first title for its own merits without the ability to compare it to the better follow ups. The world was a different place twenty years ago, so at times you notice reviewers making cultural references that are no longer relevant. But interestingly, now I'm the same age that many of the reviewers were, I've begun to appreciate their perspective more. When I first read the reviews I was a child reading the opinions of an adult. However, now twenty extra years of life experience has put me in the same mindset that they were in when they originally put critical pen to paper. This is probably why I laughed so much when I read Chris Buxton's 'NBA Jam' review in issue 27 of Total! magazine. "Basketball's hip. Basketball's fast. Basketball is a bit of a mystery to me" he wrote and I share the same opinion. "I'll be honest it's not really a game for the vertically challenged- I couldn't reach the basket in my school gym without the assistance of the local fire brigade. Perhaps that's what put me off." Like Chris I was exactly the same. Basketball was a big thing at my school and as this was the mid Nineties the sport was enjoying a level of popularity that it hadn't seen before or since. When I had to play basketball in sports lessons I remember getting hit in the face by the ball and being sent to the school nurse. I like to think this was to make sure no lasting facial damage had been done, but it may also have been the sports teacher's way of getting rid of the most incompetent player on the court. "Even all these years later I still can't watch it. It seems so repetitive and boring. Up and back, up and back for sixty minutes and at the end there's still only two points separating the two teams." Again, I share Chris Buxton's thoughts, although watching Basketball in the UK in 2017 is actually pretty tricky. According to Basketball England only a few NBA games are broadcast on expensive sports cable packages. That being said there is the UK National Basketball League and the British Basketball league, which boasts large numbers of supporters but has little global influence. With such a limited presence in the U.K. (and given my haunting childhood memories) I genuinely felt Basketball deserved to be pretty low on my list of sports I should care about. However, Like Chris Buxton, playing this digital version has made me reconsider this view. "'NBA Jam' has made me look at basketball in a whole new light, because this game's not only better than any other basketball game; it's also damn good fun". The game achieves the accolade of being enjoyable for those with no prior knowledge. It's a game that focuses on over the top fun, rather than accurate simulation. This is hardly surprising given 'NBA Jam's arcade origin. The Mega Drive version that I play is based on a Midway coin op. In 1993 it was enormously successful and According to a retrospective article originally posted on 1up.com 'NBA Jam’ cabinets have collected over $1 billion in quarters. A fight even erupted in a Chicago arcade over whose turn it was to play. Midway eventually sold more than 20,000 arcade units and according to the Huffington Post the highest-grossing consoles raked in $2,000 per week at their peak. 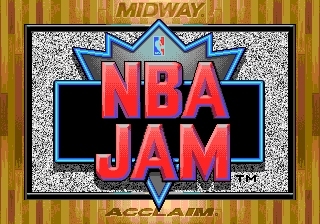 Within a year of its arcade debut the Amusement & Music Operators Association of America reported that 'NBA Jam' had become the highest-earning arcade game of all time. It was popular due to its fast pace and simplicity, something that designer Mark Turmel achieved by removing more than half the players and ignoring most of the sport's rules. There are no fouls, free throws, or violations except goaltending and 24-second violations. This keeps the game fast and frantic and means that players can barge each out of the way. Indeed even the rules of gravity and biology have been ignored. Characters are able to jump many times their own height, making slam dunks that defy both human capabilities and the laws of physics. Taking further liberties with what's considered realistic, the featured NBA Stars can even catch fire if doing well, something I understand, that doesn't happen regularly in real life basketball. If a player makes three baskets in a row, he becomes "on fire" and enjoys improved shooting abilities and faster speed. He'll remain "on fire" until either he scores four more baskets or the other team scores one. However not all critics enjoyed this aspect or the game, especially in home ports. 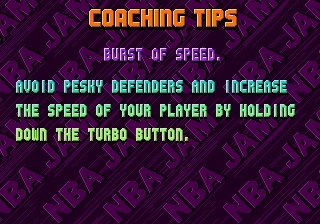 "The turbo is so plentiful that you can practically use it during the entire game, and blocking shots is nearly impossible" wrote Julian Rignal. 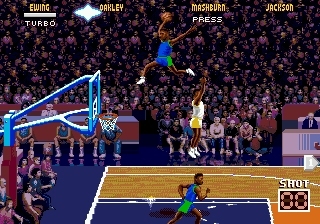 'NBA Jam' essential revolves around mastering various dunks three pointers and stealing the ball from the other team. It’s all ludicrously basic but that keeps it accessible to all and fantastic fun. "The game accepts you're operating someone who is damn good at basketball so you don't have to worry about bunging a ball miles away from your team by accident or falling over when you should be dribbling successfully around the enemies" noted James Leach in a Super Play review. "So forget about the basic playing techniques because that’s all done for you. Just concentrate on the action and action it is, you race up and down like a mad thing, the points notching up a tremendous rate." The game is actually a sequel of sorts to 'Arch Rivals' an earlier Midway game designed by Brian Colin (a man best known for creating 'General Chaos'). Like that game, 'NBA Jam's two on two matches focus on quick point accumulation rather than long game tactics. Having NBA teams but not a full squad also allowed Midway too elegantly dodge specific player licensing issues. The game was made during NBA's "golden age" so you get many of the all-time greats that would excite fans of the sport. Evidently the inclusion of David Robinson, Karl Malone, Scotty Pippen, Patrick Ewing, Reggie Miller, and Clyde Drexler was impressive. However Michael Jordan and Shaquille O'Neil (who I have actually heard of) both opted out of the National Basketball Players Association's shared licensing agreement, in order to negotiate their own more lucrative deals. So neither appeared on the Sega Mega Drive and Super Nintendo version of the game. While their omission may have been saddening for genuine fans, it was made up for by the inclusion of cameos. In the Mega Drive version entering a specific name allowed access to hidden characters including Bill and Hillary Clinton and the game's designer Mark Turmel. However selecting the latter gave you an unfair advantage given that he had perfect stats for all styles of play. "When you put in the code for my secret Character there's just question marks for the stats" Turmel admits. "They're really all 10's or 9's, I'm pretty good in 'NBA Jam'!" I've always thought that outside of the Arcade 'NBA Jam' should be played on a Mega Drive, however while it sold better on this console the Super Nintendo version is superior. Despite the simplified game rules, the controls seem excessively complicated. Players will behave differently depending on their position on the court, if they have the ball or if their team mate has the ball. The Mega Drive controller seems to not have enough buttons for all of this. Many may argue that, you only need three buttons; one to shoot, one to pass and one for turbo, but to do some actions a combination must be pressed. For a game that has such emphasis on dunking; you'd think you wouldn't have to hold two buttons to get a player to do it. Even tackling doesn't have its own designated button. The SNES's shoulder buttons were really the key, aided by the extra action button. At least the Mega Drive controls are responsive and as there are only four players it's easy to keep track of who you're in control of. When alone you can either control one player all the time or switch between the two. While not tactical, matches are always exciting, and this excitement magnifies the more human players join in. Iguana Software did the home ports of the arcade game. They really have done a fantastic job of taking the complicated scalding graphics of the arcade and adapting them for the confines of a console without losing the celebrated visual identity. "The graphics are actually spectacular in 'NBA jam' said critic James Leach at the time.” Each player actually looks correct. It's difficult to stimulate people close up and make it half decent especially if they happen to be very tall, active and playing a fast moving sport but 'NBA jam' does it perfectly." But in looks the Super Nintendo again trumps the Mega Drive simply because the developers had more colours to play with. While the visual differences are only noticeable when the two versions are compared side by side, true 'NBA Jam' fans will more likely be more upset by the Mega Drive's more obvious drop in Audio quality. 'NBA Jam' is famous for its in-game commentator and the iconic voice actually belongs to Tim Kitzrow. "Id spit out everything that came to me and we improvised a lot. Years later we realised there was some magic there" he recently said. Kitzrow is not an avid gamer 'Pac-Man' remains the only game he remembers ever playing. He went into the studio and delivered the lines initially working with a script written by Jon Hey. The entire process took less than 20 hours and Kitzrow was paid $50 an hour. Considering how famous his commentary has become you'd think he would regret asking for only $900 for his vocal services. "I'm not bitter," Kitzrow says, the struggling actor was just thrilled to be in work especially considering it involved his favourite sport. "When you're young and you're trying to get a start, $50 an hour was a nice pay check. I can't look back and say I got ripped off, because that's what everyone in my role got." Kitzrow shouting "He's heating up! ", "He's on fire!" and of course the exuberant "Boomshakalaka!" are perhaps the most famous aspects of the game. The latter phrase has even snuck its way into genuine NBA commentary; hardly surprising given that modern sports pundits played 'NBA Jam' in their youth. Tragically according to Electronic Gaming Monthly magazine "[in the Mega Drive version] the voices are fuzzy". GamePro agreed saying "if you want to hear the best calls and shouts you need a Nintendo Cartridge". 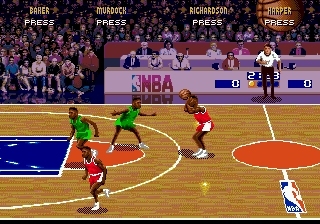 Obviously the gameplay isn't affected by an off-screen narrator in any way, but when it's horribly distorted and hard to make out, some of the 'NBA Jam' magic is lost on the Mega Drive. Even with weaker graphics and poorer sound if a basketball fan only has a Mega Drive they should still seek out the game. 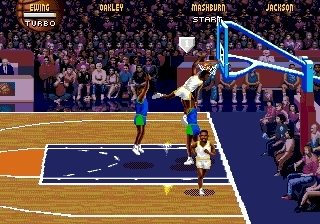 "['NBA Jam'] captures basketballs thrills far better than any other game around" Chris Buxton said in his review. "My only gripe is that solo games can become repetitive. There's not much left to discover after a couple of hours play." With four people gathered round the TV though, 'NBA jam' is undeniably fantastic. It's easy to see why Mark Turmel remains proud of the game he developed and programmed. "I look at the game now and wish it were smoother but it was the technology at the time. The game still holds up today". "Excuse the pun, but this game jams! This is one of the few sports titles I actually like and I can't stop playing it" said an EGM reviewer at the time. "It takes a lot for me to like a sports game and Acclaim has produced one of the most addicting sports titles I have ever played." Like Chris Buxton, I would never want to actually step on a basketball court, nor do I have any real desire to watch it (should I even find a way to make that possible). 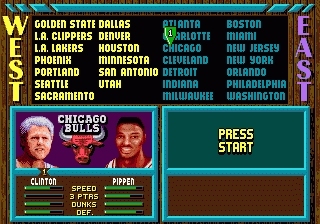 But I've found my time with 'NBA Jam' to be great fun, particularly when others were involved. Anything that is willing to embrace the ridiculous and not take itself seriously is always great in my book. What a shame so few other sports games have the confidence to forgo realism and just focus on fun. After all that's the only way they can truly appeal to an audience who would otherwise not care for the sport or sports in general! Despite knowing of its popularity I never would have bought a basketball game considering I dislike the sport. But thanks to a bulk buy bundle I got to discover that maybe basketball can be a lot more fun and more enjoyable than I ever would have believed.